Observed in Rackensack Canyon, Maricopa Co., Arizona, USA. April 2009. The moth is taking nectar from flowers of Dakota Mock Vervain (Glandularia pinnatifida). This sphinx moth flies by day when it could easily fall prey to an insectivorous bird, but because it resembles a bumblebee it is more often avoided. This pattern and behavior are know as Batesian Mimicry and is very common in the insect world. The immature stage is a hornworm, a caterpillar with a distinct horn on the dorsum of the posterior, that feeds on plants in the Honeysuckle Family, Caprifoliaceae. 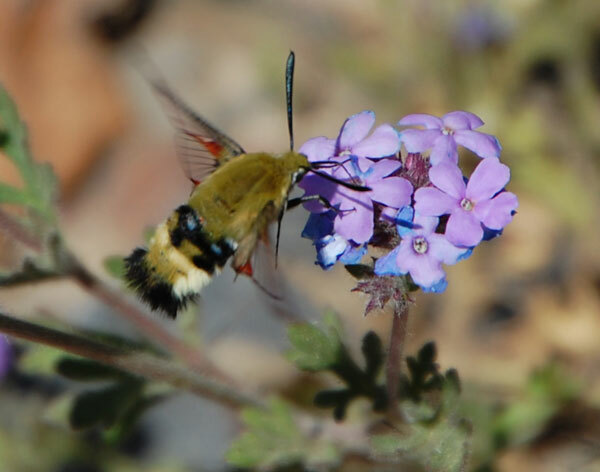 A widespread insect, the Snowberry Clearwing is found through the western and northeastern United States and Canada. In the Sonoran Desert it is mostly encountered at higher elevations in transition to chaparral or oak-juniper woodland. Copyright Michael J. Plagens, page created 28 April 2009.